Warehouses and factories dot Chicago and its suburbs, concentrating hundreds of thousands of workers in a major hub for transporting goods. If these workers were united enough to strike, they would have huge leverage. But can they overcome a slew of obstacles to organize? The jobs are low-wage and largely temporary. An estimated 63 percent of Chicago’s 150,000 warehouse workers are employed through temp agencies—where high turnover and multiple bosses are perennial hurdles. Add to that a workforce—predominantly African American and Latino—that’s divided by race and language, and you begin to see what a steep climb lies ahead for the members of a worker center called the Chicago Workers' Collaborative. Just getting to work can be a challenge. Most job sites are located outside the city core, and often far from public transit. This geography has led to the blossoming of raiteros, who charge a fee to ferry workers to and from the warehouses in vans. These van drivers also serve as labor contractors. They apply for jobs on workers’ behalf and hand out their paychecks. On average, workers earn $9 an hour—since most jobs are located in counties outside Chicago, where the minimum wage is $10. The raiteros offer convenience, especially as temp agencies reduce their branch offices in the city—but it’s a double-edged sword. The relationship leaves workers vulnerable to wage theft and harassment. Sexual harassment is a daily experience for many women workers, said Isaura Martinez, who’s worked for temp agencies for six years. “It’s an epidemic, inside and outside the factory,” she said. Instead, African American workers are forced to rely on public transit, and usually must apply directly at the temp agency. “They have to get the bus at 2 a.m. to be at the agency for 4 a.m., and wait all day,” said organizer Alma Castro. And even once they get on the schedule, workers still need to get out to the job site. These different experiences can lead to mistrust between Latino and Black communities. To help bridge the divide, the Collaborative organizes trainings and community picnics where Black and Latino workers share their stories with one another. But divisions on the job can be hard to overcome. Often African Americans do the heaviest or most dangerous work. Take Gold Standard Bakery, an industrial bakery whose products include croissants for Burger King and pastries for Entenmann’s. Castro said African American workers are placed in the hottest part of the factory. Childs was fired after a supervisor heard him on his cell phone during a break, complaining about the conditions. When he contacted the agency about his paycheck, he was told he’d been given a “Do Not Return.” The center is helping him file charges over the retaliation. Rose has been working to build solidarity with his Latino co-workers. At first many had the attitude, “Don’t talk to us, don’t train us,” he said. Gradually his trust-building is starting to pay off. Workers come to Rose when they have a problem with a supervisor. “They mistreat one of us, they mistreat all of us,” he said. Another organizing challenge—workers don’t know whether they’ll be back tomorrow. Client companies can fire temps with little scrutiny, and it’s in the agency’s interest to keep workers on its own payroll rather than helping them get permanent jobs. When Rose persuaded five co-workers to sign a petition about various health and safety problems and discrimination in hiring, the Collaborative put together a delegation. Organizers and community supporters joined Rose as he presented the petition to bakery management and the temp agency. The tactic worked. Rose said the company has made many of the changes that were on the petition, such as providing more fans, new coolers for water, and more breaks in a cooler area of the plant. The center remained his home base even after he made the transition from temp to permanent employee. He still wants to see more Black workers hired on permanently, and not concentrated in the hottest jobs. Another focus for the center is confronting sexual harassment. In the women’s committee, workers strategize about how to take on violence at work—as well as domestic violence at home. “You can’t place a complaint for harassment if your husband is going to blame you,” Castro said. The center has helped workers to file criminal complaints. In August, a van driver for the temp agency Most Valuable Personnel was sentenced to six months in jail for assaulting a female worker. Afterward, at least 12 women agreed they would not go back to work at that job site. “From there, I started to find my courage,” Martinez said. “There is no reason to hide my face, because I am telling the truth. On paper, Bell said, Illinois has the nation’s strongest regulations on how temp agencies can treat workers. Agencies are required to register with the state Department of Labor and to notify workers what their job and wages will be. The law prohibits them from deducting fees from wages, including for transportation. But as basic as these rules might sound, enforcement is weak. “Very rarely are employment notices given, and there is no minimum fine for not giving them,” said Bell. The center is working to get new legislation introduced. But ultimately more powerful than the temp agencies, Bell said, are the employers who contract with them—the warehouses and factories. Until recently, it was almost impossible for temp agency workers to organize a union and bring both employers to the table. Temp agencies were usually considered the sole employer. But the 2015 Browning-Ferris decision changed that, expanding the concept of a “joint employer” to include many of the client companies that use temp agencies. A subsequent decision also knocked down the legal requirement to get employer consent for temps to belong to the same bargaining unit as permanent employees. At Gold Standard permanent employees are members of Workers United, but their co-workers who are temp workers don’t join them in bargaining. These rulings give unions new legal leverage to compel the real employer to negotiate. 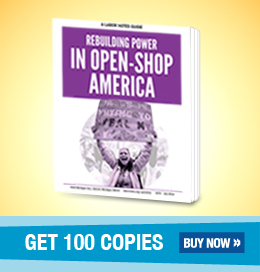 “It opens the door for a new approach to temp worker organizing,” said Bell. The Collaborative’s goal is to win negotiated agreements so that workers can stay at one job site and receive the wages and benefits that permanent workers get. A version of this article appeared in Labor Notes #453, December 2016. Don't miss an issue, subscribe today.